Writer/director, Andrew Dominik reteams with his The Assassination of Jesse James by the Coward Robert Ford collaborator, Brad Pitt, for brutal crime thriller, Killing Them Softly. This collaboration released in UK cinemas this week, proves to be one of the most powerful, meticulously crafted pictures of the year. 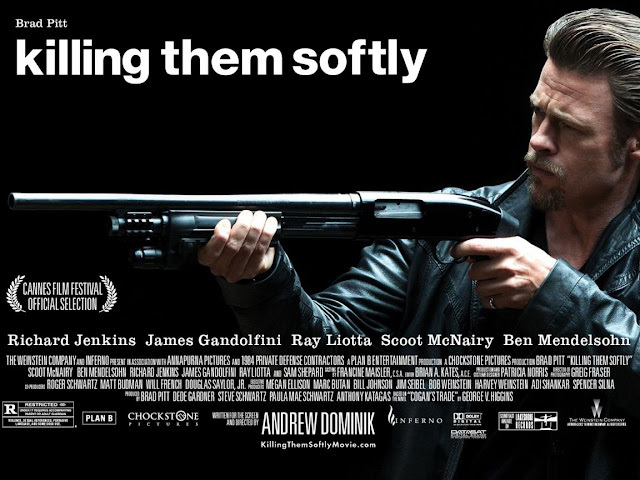 Set against the backdrop of the 2008 US election and worldwide economic crisis, Killing Them Softly follows Jackie Cogan, an enforcer called in to investigate a heist that hit a mob protected poker game. From the title sequence, Dominik's stirring direction immediately hits us. We see a desolate New Orleans estate inter-cut with the jarring opening titles and a speech from Obama. This marks the start of the ongoing social commentary that runs throughout Killing Them Softly which shows us that even the mob is hit by ensuing financial crisis. We are presented with a bleak, realistic world where everything is carried out by middle men and responsibility continually falls onto others. This commentary may be lacking in subtlety but as a viewer who notices these issues in our everyday lives, it is hard not to buy into Dominik's thoughts. Dominik directs with a frank realism, that truly attacks all the senses. From the clamminess of desolate rain-drenched locations to the brutal sequences of violence - Killing Them Softly is visually unforgettable. Dominik's direction is refreshingly focused and to the point, paralleling Cogan's blunt attempts to cut through the lies and blame-dodging in his hunt for answers. This bluntness is not simply metaphorical but visual also, most explicitly reflected in a haunting sequence which sees Ray Liotta's mob boss face a bloodthirsty beating at the hands of two goons. Shot in slow motion, against the sounds of bone-crunching and yelps of pain this is possibly the most chilling sequences of cinematic violence in recent years. From moments of intense violence, Dominik's screenplay is soon followed by touches of well-handled black comedy. This parallel between violence of humour captures the cold nature of Dominik's America - where as Cogan puts it in a stirring monologue - America is business where there is no such thing as a community. Pitt's Cogan who despite being a murderous sociopath, has a clear moral code that he abides to - this is a man who cuts straight to the point. Pitt is truly magnificent, managing to hold the viewer in his grip with an almost effortless power. The ruthless efficiency of Cogan strikes some clear parallels with the protagonists of seventies crime cinema tough guys. 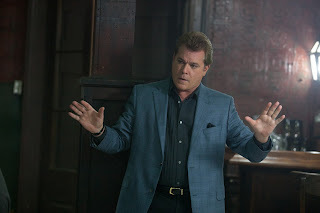 Killing Them Softly also features a staggeringly powerful turn from Ray Liotta as the mobster haunted by his past mistakes. 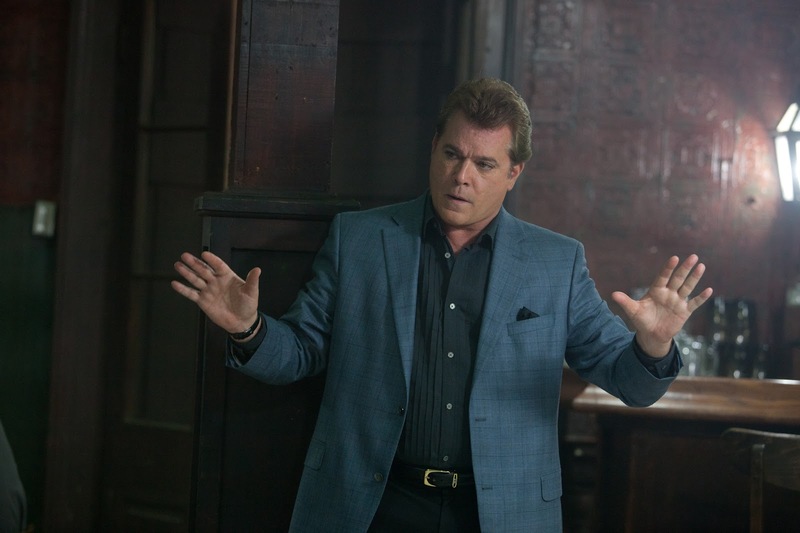 Liotta handles the character's slow decline into the depths of fear and desperation flawlessly, marking this as one of his finest performances in recent years. There are also pitch perfect supporting turns from Scotty McNairy and Ben Mendelsohn as two petty crooks, unaware of the trouble they have caused by robbing the mob poker game. Veteran star James Gandolfini appears as a broken down hitman and Richard Jenkins shines as the middle man between Cogan and the mob. Whilst Killing Them Softly's social commentary may appear slightly clunky, one cannot argue with its relevance. Andrew Dominik has presented us with a brutal and visually unforgettable piece of crime noir, that is perhaps the standout feature of the year.